12″ Checker Wood Pepper Mill – Satin Finish. One-of-a-kind-functional art pepper mill includes extraordinary woods: Bubinga, Walnut, Maple, Cherry, Hickory, Brazilian Cherry, and Mahagony. Please select grinder mechanism as a Salt Grinder or Pepper Mill. 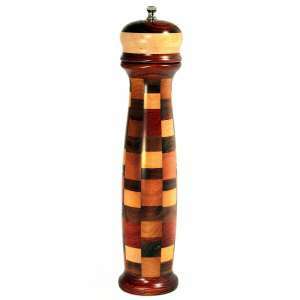 12″ Checker Wood Pepper Mill – Satin Finish. One-of-a-kind-functional art pepper mill includes extraordinary woods: Bubinga, Walnut, Maple, Cherry, Hickory, Brazilian Cherry. Please select grinder mechanism as a Salt Grinder or Pepper Mill.